View cart “ICE Full Fat Trike” has been added to your cart. BRC: Probably the fastest production trike ever offered, the VTX replaces the ICE Vortex. It is light, stiff, low and like a street luge you can pedal! 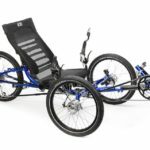 ICE: Inspired Cycle Engineering Ltd announces the launch of their new racing trike: the ICE VTX™. 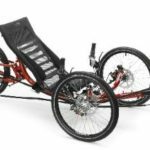 Based on the pedigree of the ICE Vortex and building on ICE’s design heritage, the ICE VTX™ represents the epitome of specialist design, incorporating decades of technical knowledge culminating in a new breed of recumbent trike. Sleek, lean and finely tuned, the ICE VTX™ delivers superior performance, speed, and precise handling to even the most exacting rider. 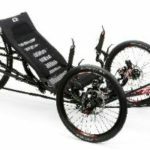 A speed-optimized frame featuring a hydro-formed back-end and unique lightweight boom ensures a ride with stiffness and optimal power transfer whilst remaining lightweight. A one piece handlebar and specific cruciform geometry ensure nimble and stable handling at high speed, providing responsive feedback and enabling rider confidence even in the most extreme circumstances. One of the first things instantly noticeable on the ICE VTX™ is the new seat cover. Built over our anatomically designed hard shell seat, ICE has developed a cover that fits perfectly whilst providing comfort and airflow. Incorporating the latest performance fabrics and a combination of foam cell structures, all carefully positioned to provide optimal power transfer, comfort and, airflow. In the pursuit of lightweight performance the ICE VTX™ features elements unique only to this model. The rear section of the ICE VTX™ has been designed using custom hydro-forming to create a back-end that is second to none. The hydro-forming process affords greater control of material wall thickness, allowing characteristics to be engineered into the frame; the result is a rear triangle that is tuned for stiffness, strength and vertical compliance – in other words, a responsive and comfortable ride, all in a lightweight package. Every aspect of the ICE VTX™ has been scrutinized, from new chain guides to re-designed axles, exemplifying ICE’s dedication and attention to detail. A new adjustable seat bracket, with five discreet settings (as low as a 25 degrees), which makes finding that perfect riding position quick and easy. This improves rider comfort and aerodynamics, and tucks the rear wheel tight in behind the seat reducing the wheelbase and improving traction – you get out what you put in! The front wheels with ICE SL32 front hubs, and reduced spoke count, have been designed specifically for all out performance. The componentry selected for the ICE VTX™ has undergone no less scrutiny. The SRAM Type 2 rear derailleur with rolling clutch and cage lock technologies, coupled with SRAM’s 5951 Carbon crank set and SRAM Rival front derailleur delivers maximum drivetrain stability. The Tektro Auriga Hydraulic disc brakes provide exceptional braking performance and Jagwire cabling throughout with sealed end caps ensures that gears change perfectly mile after mile. 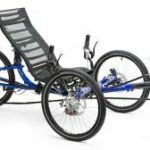 Using the latest technologies, finest materials and expert engineering skills ICE has produced yet another trike that is second to none in its class. All weighing in at under 30lb!